A few weeks ago, Joanna joked that I should write a guest post on a subject she and I both find intriguing: moon trees. Even though I find myself joining AmericanScience as a regular contributor instead of a guest, and should probably begin a little more seriously, I find the topic too fun to pass on a chance to talk about it. “Moon tree” usually refers to a tree grown from one of several hundred seeds that orbited the moon during the Apollo 14 mission in 1971. These were subsequently cultivated by the Forest Service and distributed across the country as seedlings. Many were planted in public spaces in celebration of the country’s bicentennial in 1976. 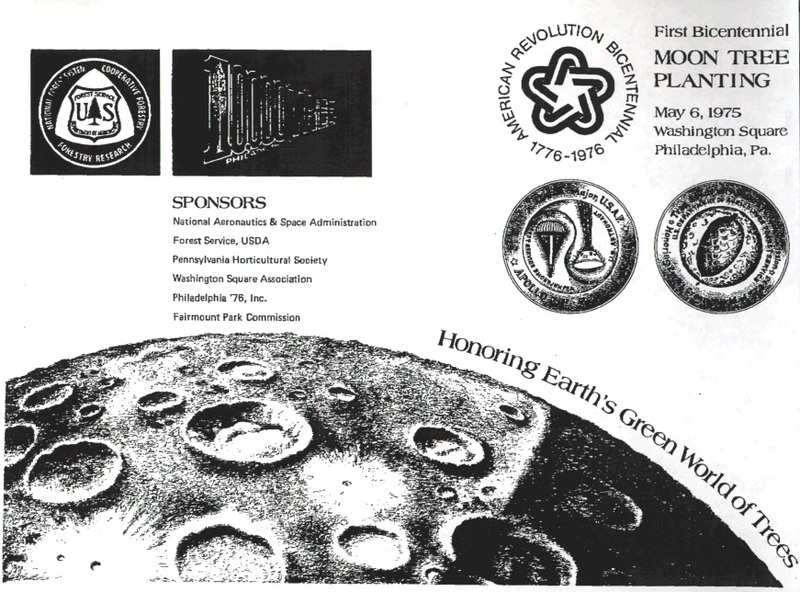 Sponsored in part by the Forest Service, the tree plantings were also meant to “mark the contributions forests have made to our way of life.” So when the first planting of a bicentennial moon tree took place in Philadelphia’s Washington Square Park, both Apollo 14 astronaut Stuart Roosa and Woodsy the Owl presided. Space flight. Founding ideals. Forest stewardship. That’s a lot to ask of just one tree. Having just heard a talk by Neil Maher of Rutgers/NJIT, whose work on the environmental history of the space race connects this history to many currents of American culture and politics in the 1960s and 70s, I know not to be too surprised by the mishmash of ideas represented in the bicentennial moon trees. Most obvious here is the entanglement of space exploration and environmentalism, i.e., the idea of “Honoring Earth’s Green World of Trees” with a plant that had come so near the barren, lifeless surface of the moon. As I see it, the interesting aspect is less the potentially confusing symbolism and more that individual trees are rather transient tributes to these weighty subjects. As living symbols, they will by their very nature someday be dying symbols. The moon tree in Washington Square was taken down just a couple of weeks ago, apparently after nearly three years of being pretty much just a barren, lifeless trunk. Honoring Earth’s Green World of Trees, indeed. So it seems like this idea went awry somewhere, right? Wrong. Wrong because “moon tree” now increasing applies to clones of the trees, or trees grown from seeds of the original trees. In 2009 NASA celebrated Earth Day by planting a second-generation moon tree at the National Arboretum. The Philadelphia tree has just been replaced with its own clone, a sapling sycamore. Apparently a few years ago you could even buy your own moon tree, derived from one of the original moon sycamores, direct from the American Forest’s Historic Trees program. Which is why the moon trees are actually pretty brilliant: as living entities reproducible at minimal cost there is, theoretically, an infinite supply. Not only can the living symbol of the moon tree be made immortal, in a way, but it can also be widely distributed. We don’t even have to go back to the moon! NASA made a call for information about the location and condition of the bicentennial moon trees, old and new, just this year. The amount of publicity it has generated demonstrates that people are still pretty interested in these space-age artifacts. And, unlike moon rocks (which can get you into big trouble) or pieces of spacecraft (except when they fall from the sky), I bet it’s pretty easy to gather your own space-race memento from some of the moon trees. In short, these organic monuments are a successful if unconventional reminder of an intensely technological accomplishment, and perhaps also of the Founding Fathers and the need to prevent forest fires. But it’s not really because they call to mind a specific event in the history of spaceflight. It’s because they feed on – and quite literally multiply through – the imaginative appeal of space exploration and popular interest in its material artifacts. It kind of makes you rethink plaques and concrete slabs, doesn’t it? This entry was posted in Helen, monuments, NASA, Philadelphia, science and its publics, trees on October 10, 2011 by americanscience. Hooray for Helen! So glad to see you writing here, and about moon trees no less! Ever since I was a little kid, I wanted a tree planted over my grave site, rather than a headstone. Kind of the same idea? Thank you, Helen, for this important post! I experienced a moment of despair when you related that the Philly moon tree had been taken down — only to breathe a sigh of relief at its replacement via the miracle of cloning. While I would certainly have attended the replanting of the sycamore sapling had I been in town, I wonder what the turnout was like? Was there a ceremony at all? I'm imagining a small group of confused onlookers at Washington Square Park, and a sad smattering of applause from a token bureaucrat or two. Perhaps NASA is in a similar predicament post- Cold War funding? I bet's that an important factor in NASA's continued attention to the moon trees, yes. Their celebration of Earth Day at all, regardless of moon tree planting, could in fact be thought of along similar lines: (a space historian could correct me here) Earth observation and environmental tracking are a key part of NASA's current claim to everyday relevance. Of course NASA celebrates Earth Day! As for the moon tree in Washington Square, I was only able to find one report, which confirmed that there was in fact a replanting ceremony in which officials were present (and Stuart Roosa's son), the old tree was cut down, a speech made about the cloned tree (by a representative of the Morris Arboretum, which had doing the grafting), and then the clone planted with assistance from the assembled crowd. Sadly, there was no information on how many people. It was entirely a National Park Service event, so far as I can find, and I assume it was a part of continued stewardship of the Philadelphia parks. And yet… like any good historian of science and culture, I think this is a two way street. Popular interest can feed organizational interest. When I poked around in the news stories about the trees in various communities, many planted at schools or town parks (in addition to places like the White House and the Goddard Space Center), I saw that community celebration was clearly an important component.